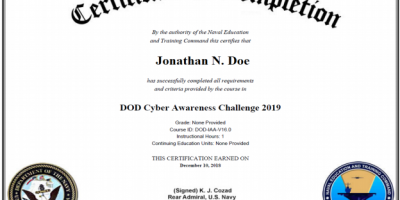 DISA is the current developer of the yearly training and you can either go directly to your service/command IA person, or use one of the links below. If you have any other links for the DoD Information Assurance Awareness Training, or an updated version, please contact us and let us know. I was wondering when the next scheduled IA Awareness Day at OSD will be? ViaSat is interested in participating at the event. Are you going to be loading v3 anytime soon? Yes, we are putting it up in just a moment! 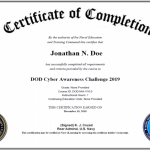 Will the Personally Identifiable Information (PII) online training ever be made available on the DISA site and not require a CAC card to access? We have DoD civilian new hires who report on board and for whatever reason, mostly stemming from HR processes, they are unable to obtain a CAC for two weeks or longer upon reporting on board. Yes, we have the same issues. I don’t think there are any current actions to make the PII training available to the public. If we hear anything different, we will post it here! We had issues reaching the site also. We believe that it was down temporarily. It’s possible a new update is coming! Where do we sign the AUP? Is this the same as Cyber Awareness Challenge CBT certification?